PPP pariamentarian, Komal Chand addressing the National Assembly during the debate on the 2016 Budget Debate. The Head of the Guyana Agriculture Workers Union (GAWU) and People’s Progressive Party (PPP) MP Komal Chand has disclosed that the sugar factory at Wales Estate is the exact same as the ones at other sugar estates. 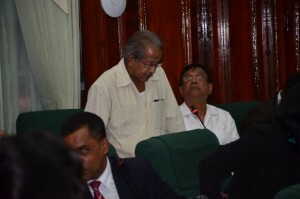 Chand made the statement while delivering his offerings on the 2016 Budget debate where he flayed the government over the decision to close the Wales sugar factory. He said that effectively, the closure means the silver lining in the sky has disappeared stating that hundreds of persons have now been placed on the breadline. He told the House that Wales factor would be just as old as the other factories with the sole exception of Skeldon Sugar Factory. “The cane knives utilized at Wales factor are similar to those at four other factories; its mills are similar to those used at Blairmont and Uitvlugt factories; the boiler is like the ones at Rosehall and Uitvlugt,” Chand stated. He went on to list several other mechanisms that were similar and still in operation at other factories. “The so called age argument cannot really be a serious or strong reason for the arbitrary shutting down of Wales estate,” he argued. He said that if the closure comes to fruition, the industry stands to lose more than 20,000 tonnes of sugar per annum. Government and Guysuco have assured that every effort is being made to save the 1,700 corporation jobs by diversifying operations into aquaculture, cash crop farming and dairy production.